Welcome to Hike 3 in my Summer Hike Series in collaboration with Peak Training Whistler. If you follow me on Instagram, you probably saw my stories about needing to up my hiking game in order to keep up with Meaghan, owner of Peak Training, because no matter how fit you think you are, your trainer is always fitter. Much, much fitter. This brings me to our recent hike to Rainbow Lake, which is 16 kilometers (10 miles) round trip and sees an elevation gain of 850 meters (2700 feet). It took us 3 hours to hike up and about 2.5 hours on the way down, including lots of stops for photos along the way. The first hour of the hike is straight climbing. There has been a new hiking trail created over the first few hundred meters (previously you’d walk up a road) and there’s been a lot of trees slashed. You can see that it was done intentionally for controlled burn however it’s not very pretty to look at, unfortunately. You’ll come to a junction that directs you right to Rainbow Falls but you’ll want to stay left where, a few meters away, you’ll then see signage for Flank Trail and Rainbow Lake. Stay right to take the latter. You’ll be on a wide gravel path which runs adjacent to 21 Mile Creek down below, and within a few minutes, you’ll catch your first scenic view looking back towards Whistler and its lakes. I knew whatever views awaited us at the top were going to be spectacular. In order to protect Whistler’s water supply, there are three outhouses along the way. YES! You’ll come across the first one just as the trail narrows and heads into the forest. This is where the climbing – or as I call it, keeping up with Meaghan – really begins. One of my favourite parts of the Rainbow Lake Hike is all the bridges along the way. There are several small wooden bridges, a very cool cable bridge, and a small suspension bridge all overlooking waterfalls of various sizes. They’re so beautiful! The final stretch leading up to the lake was a beautiful path through a meadow. The views were amazing; you could see Rainbow, Blackcomb, and the majestic Wedge Mountain. Much to my surprise, there was still snow up at Rainbow Lake and a lot of ice covering it. It was melting rapidly and it was quite cool to see the ice cruising towards the bridge we were standing on then breaking up and going down the waterfall. It really doesn’t get much fresher than that! There’s a boardwalk that takes you around the lake and you can go all the way to the back and look out over the lake with Wedge in the background. The mountains look enormous. There are benches around the lake and also looking out above it. Be sure to take your time and enjoy the lake. It’s the perfect spot to rest and refuel – we spent two hours here(!) – before heading back down. Rainbow Lake is the ideal high-intermediate hike to do in July once most of the snow has disappeared and your hiking legs are ready. There’s limited parking, and because the few spots are shared for those simply going to see Rainbow Falls, be mindful that it will seem busy quickly. It’s definitely best to go up first thing in the morning to make the most of the day. I pulled out my Salomon hiking boots for the first time this season and I’m so glad I did. I have a tendency to sprain my ankle a lot and given the abundance of rocks and roots on this hike, I was glad to have the extra support. Also, the grip made the descent significantly easier. I wore these boots on my Bhutan trek through the Himalayas and cannot recommend them enough. As always, make sure you’re dressed for the mountain climate. It was sunny and hot when we went however the weather can change quickly on the mountain and it’s often much cooler than you'd expect. I highly recommend layers like the Arc’teryx Atom LT jacket and Alpha SL Jacket; they’re basically bulletproof and I never leave on a hike without these two items in my bag. The Rainbow Lake trailhead is on Alta Lake Road and is a short 10 minute drive from the village near the Rainbow Park entrance. The lake provides the water supply for Whistler so there is no camping, swimming, or bathing allowed, and absolutely no pets. I loved this hike for the challenge but mostly for the scenery. Make sure to check out Meaghan’s blog for training tips for this hike over on Peak Training. As the season progresses, we will give you the inside scoop on each hike to make sure you’re ready for it. Stay tuned for our fourth hike, coming to you in a few weeks! And don’t forget to read about our first and second hikes, Cheakamus Lake Hike and Crater Rim Trail Hike respectively, if you missed them. DID YOU DO THE HIKE? in your post so we can follow your adventures! There’s a fun new attraction in Whistler that will be taking sightseeing on Whistler Blackcomb to, literally, a whole new level. A 130 meter (427 feet) long suspension bridge opened Canada Day weekend (July 1, 2018) at the top of Whistler Mountain. To access it, you need to take the Whistler Village Gondola up to the Roundhouse Lodge at the top of Whistler Mountain. From here, you’ll follow a walking path to the right that leads down towards the Peak Express chairlift. Take the Peak Express to the top and you will see the suspension bridge on the right side. The Cloudraker Skybridge Suspension Bridge stretches from Whistler Peak to the West Ridge, high above Whistler Bowl. The West Ridge Lookout, still under construction, will consist of viewing platform and a cantilevered walkway that will extend 12.5 meters (41 feet) out from the West Ridge. (Currently you must cross back over the bridge the way you came.) I can’t wait for the viewing platform to open! The Cloudraker Skybridge Suspension Bridge offers 360° panoramic views, from the iconic Blacktusk and Garibaldi Lake to Whistler village and the entire coast mountain range.The bridge is a little wobbly, especially in the middle, but that's to be expected. I definitely didn't find it to be a deterrent. The entire experience is truly breathtaking. A lift ticket is required for Whistler Blackcomb summer sightseeing. One day tickets are $58 CAD and allow you to hike both Whistler and Blackcomb mountains, and to also take the Peak 2 Peak between them. If you have a 2017/18 Winter Season Pass, you can purchase a summer sightseeing pass for $89 CAD. If you’ve already purchased your 2018/19 Winter Season Pass, you have unlimited access to sightseeing all summer long. The Whistler Village Gondola opens at 9 a.m. and the Peak Express chairlift opens at 10 a.m. Times may vary so be sure to check WhistlerBlackcomb.com for updated information. I recommend going up first thing in the morning to beat the crowds. Make sure you’re dressed for the mountain climate. It was sunny and 25° Celsius the day I went however the weather can change quickly on the mountain and it’s often much cooler than you'd expect. I highly recommend layers like the Arc’teryx Atom LT jacket and Alpha SL Jacket; they’re basically bulletproof and I never leave on a hike without these two items. Plus they’re so lightweight, you can just cram them in the bottom of your pack if you don’t need them. And of course you’ll want to ensure you’re wearing appropriate footwear like runners with grip or hiking boots, too. Don’t be that person who goes up in flipflops or heels, ok? After experiencing it myself, I can see the The Cloudraker Skybridge Suspension Bridge being the best place in Whistler to take Instagram-worthy photos and see our extraordinary mountain vista views. Will you try it out when you’re in Whistler next? In my research, I learned that British Columbia is home to 18 dormant volcanoes and several of them are in close proximity to Whistler. How cool is that? Which brings us to an almost unknown Whistler hike called Crater Rim Trail. As the name alludes, the trail circumnavigates a volcanic crater which is filled with water and known as Loggers Lake. I’d classify this hike as Low Intermediate as it only takes about two hours round-trip. It has an elevation gain of 230 meters (or 76 floors according to my fitness app) over 4.5 kilometers. Within the first couple minutes on the trail, you’ll come to a sign that directs you left to Crater Rim Trail or straight to Logger’s Lake. They’re marked Difficult and Intermediate, respectively, but don’t let that dissuade you. Crater Rim is highly accessible and offers incredible views. Onwards and upwards, hikers! The first ten minutes of hiking go almost straight up but then you’re immediately overlooking Loggers Lake. It’s incredible to look down knowing that it was once an active volcano. The views are gorgeous however if you’re afraid of heights, take care near the edge. It would be a painful and bumpy trip down. You’ll continue to climb higher for another 30 minutes or so through a beautiful old growth forest for which British Columbia is renowned. I was surprised to hear a rushing of water which turns out to be Cheakamus River on the opposite side. It was incredible to stand up there looking out over the vast landscape – it looks unreal! The Crater Rim Trail is a loop so you’ll eventually come around the other side and it’s so cool to look across to where you started. It makes you realize just how large From this side, you can see out over the mountain range and across the Sea to Sky highway. What a view! As we wound our way back down to the lake and came across a rope swing! We weren’t nearly brave enough to jump in to the frigid waters but I can imagine on a hot day, it would be glorious! The fine print… At the Function Junction intersection, about 15 minutes south of Whistler, you’ll turn onto Cheakamus Lake Road (East direction). This is the same way to Cheakamus Lake Hike except you almost immediately take a left turn at the fork, then right and over a small bridge. It’s a short two kilometer drive to the Loggers Lake parking lot from here. An outhouse is available at the parking lot but it’s one of the only ones in the vicinity so be sure to make use of it. This is the second in a summer hiking series that Meaghan and I are doing. 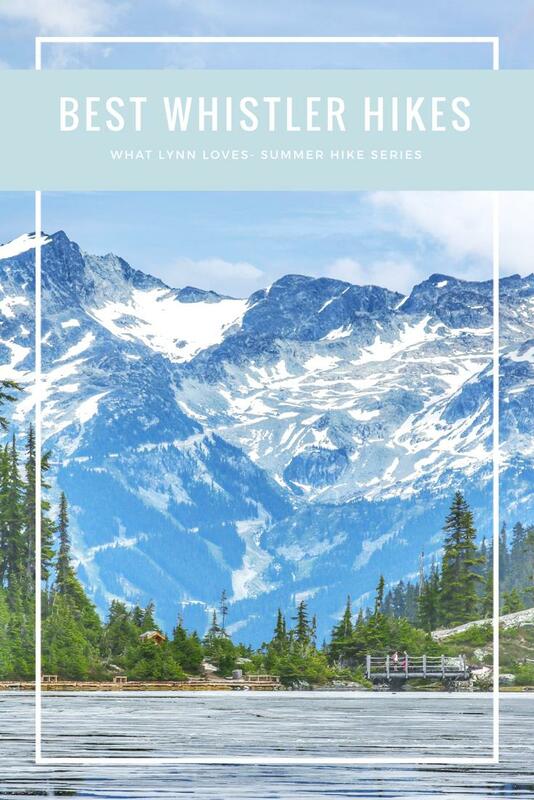 As the season progresses, I'll be giving you the inside scoop on where to hike in Whistler and how to prepare for each while Meaghan will be providing training tips so you're feeling strong and ready for each progressive hike. You can see her training tips for this hike here. So stay tuned to my blog for more hikes coming your way all summer long! Do you have a favourite Whistler hike that you think should be on our list? Tell me below!